Concern for the coordination of water and sewer facility planning and operation has existed in Atlanta since the early 1930s. Construction of the metropolitan sewer system began in 1944 as a cooperative effort between Atlanta local governments. From 1950 to 1952, a major functional consolidation, The Plan of Improvement, was prepared to better define service functions between the city of Atlanta and Fulton County. Atlanta was the primary provider of sewage treatment at that time. During the 1960s, the near-septic conditions in the river concerned many people. Utility of the waters was greatly reduced, threatening water supplies, recreation, and aquatic habitats. Studies were conducted to identify problems and needs. Technology was available to remedy many of the problems identified, but funding was unavailable. The Georgia Water Quality Control Act (enacted 1964, amended) was the first major state law to be applied to water quality management. The act gives the Georgia Environmental Protection Division (EPD) authority to control all types of pollution in the state's waters from both point and nonpoint sources. In the late 1960s the Atlanta Region Metropolitan Planning Commission (now the Atlanta Regional Commission or ARC) prepared several reports on the consolidation of water and sewer services. The Preliminary Water and Sewer Report, issued in 1968, provided elements of an Administrative Plan for water and sewers in the Atlanta region. The report called for a basinwide water and sewer authority, representing nine counties, to oversee water quality management on a basinwide scale. Unfortunately, local officials did not support the plan because of the large estimated cost (Hammer, Siler, George Associates, 1975). The next state-level move toward regulation was the Metropolitan River Protection Act (MRPA) (enacted 1973, amended), which allows the ARC to advise local governments when proposed developments violate the Chattahoochee Corridor Plan. The plan establishes standards for development based on the carrying capacity of the land within 2,000 feet of impoundments or riverbank of the Chattahoochee or within the 100-year floodplain, whichever is greater (ARC, 1984). The Soil Erosion Act of 1975 also created controls over the effects of development in the area. This act requires local counties and municipalities to adopt and enforce local ordinances to control soil erosion from land-disturbing activities within their jurisdiction. The 1972 CWA resulted in significant improvement of the water quality in the Upper Chattahoochee River Basin. Funding was provided under the CWA in the form of the Construction Grants Program. The state of Georgia received $117 million in 1976 under this program, but funding decreased steadily with only $41 million provided in 1983, despite the fact that Georgia reported needs of $300 million in 1983 (LMS, 1989). Beginning in 1988, funding for the Construction Grants Program was reallocated to the Clean Water State Revolving Fund (CWSRF) as a mechanism for providing financial assistance to municipalities. The CWA established secondary treatment as the minimum allowable level for municipal plants. The National Pollutant Discharge Elimination System (NPDES), a national permit program that regulates polluted discharges and requires permittees to monitor effluent quality, is also included in the CWA. States were called upon to develop water quality standards, water use classification, and effluent limits based on water quality criteria established by USEPA. Attempts were made to improve water quality in the Chattahoochee River by regulating flow. The EPD set requirements for minimum flow of 750 cfs upstream of Atlanta (Cherry et al., 1980). A regulatory dam downstream from Buford Dam has been proposed and modeled (Zimmerman and Dortch, 1988). The dam would ensure Atlanta's water supply into the twenty-first century, aid in regulating river flow and eliminate the requirement for minimum releases from Buford Dam. It is not possible to greatly affect flow, since there is a limited amount of water available and water supply demands and wastewater flows continue to increase. Major improvements in water quality occurred in the Chattahoochee Basin during the 1970s and early 1980s, resulting from implementation of secondary treatment. The effects of the increasing load of wastewater were diminished by better treatment technology. Figure 10-7 shows the increasing trends of effluent discharge rates for the area's larger wastewater treatment plants. By 1974, all Atlanta-area waste treatment facilities had been upgraded to provide secondary levels of treatment. Before implementation of secondary treatment, DO levels were severely reduced by wastewater discharges from Atlanta (Figure 10-8). 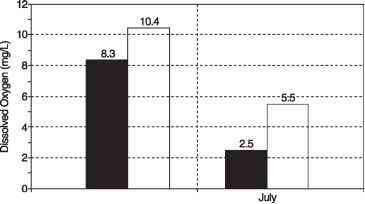 Figures 10-6 and 10-8 show dramatic improvements beginning in 1974. The effects of secondary treatment on DO concentrations are particularly notable during the summer months (Figure 10-9). 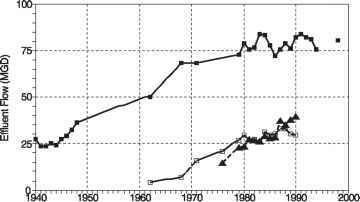 Water quality has improved despite a doubling of Atlanta's population over the period from 1970 to 1996 (Figure 10-5). Figure 10-7 Long-term trends of wastewater flow for major wastewater treatment plants in the Atlanta area. Sources: ARC, 1984; USEPA, 1971; USPHS, 1963; Woodward, 1949; Richards, 1999. 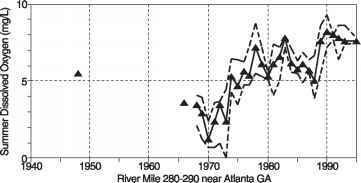 Figure 10-8 Long-term trends of mean, minimum, and maximum summer DO in the Chattahoochee River near Atlanta, Georgia (RF1-03130002066) (River Mile 280-290). 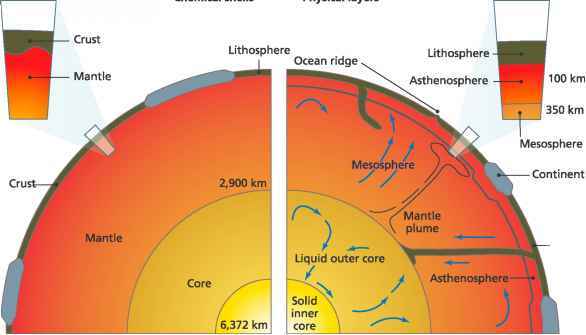 Source: USEPA (STORET). Figure 10-9 Comparison of January and July mean dissolved oxygen below Atlanta wastewater discharges before and after upgrade to secondary treatment. Source: EPD, 1981. Figure 10-10 Performance of the R. M. Clayton wastewater treatment plant. Sources: ARC, 1984; USEPA, 1971; USPHS, 1963, Richards, 1999.
concentration in the effluent wastewater. The R. M. Clayton plant was upgraded to advanced secondary with ammonia removal in 1988. In June 2001 construction to upgrade and build new facilities at the R. M. Clayton plant, the Utoy plant, and the South River plant was completed. These facilities have state-of-the-art effluent filters, biological phosphorus removal, ultraviolet disinfection, and new headworks (Richards, 2001). Decreases in the BOD5 loading of effluent at the R. M. Clayton Plant as a result of upgrading levels of treatment are shown in Figure 10-11. All of the larger wastewater treatment plants in the Atlanta region must meet treatment requirements more stringent than secondary treatment. 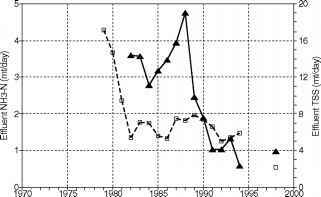 Phosphorus removal and restrictions on phosphates in detergents, for example, have resulted in a decline of ambient phosphorus concentrations downstream of Atlanta from approximately 1.0-1.2 mg/L in the early 1980s to approximately 0.1 mg/L a decade later (ARC, 1998). Land application of treated wastewater is also being used at several facilities in the region, with treated wastewater sprayed on forestland, golf courses, or other landscaped areas. At the 4,000-acre E. L. Huie Land Application site, the Clayton Water Authority operates the largest site, treating 18 mgd by reclaiming the treated effluent for its water supply since the water percolates through the soil and back to the raw water source (ARC, 1998).